The Alaska Ocean Observing System recently rolled out a new information hub that’s all about beluga whales. The Cook Inlet Beluga Ecosystem Portal is a one-stop shop for beluga data that its creators hope will help scientists and the public make more informed decisions in the future. The Cook Inlet Beluga Whale Ecosystem Portal is a new online info hub on the species. From aerial views of Alaska’s coastline to environmental data to social statistics, the new beluga ecosystem portal has a lot of information. The portal collates data from a number of sources. 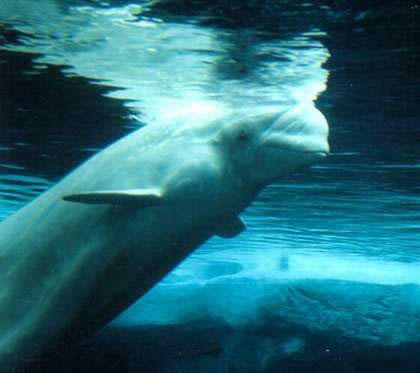 Beluga whale populations have been on the decline in Cook Inlet for many years. “It pulls information primarily from a Cook Inlet beluga whale siting database that was funded by the National Marine Fisheries Service (NMFS) that integrates about 10 years of their aerial surveys of beluga whales as well as land-based beluga whale surveys by a number of other projects," Buckalew said. The portal also includes environmental data not specific to whales, like ocean temperature trends over time, water salinity stats and more. There are a few stakeholders AOOS hopes will be able to use the portal immediately, like the Alaska Coastal Impact Assistance Program, Alaska’s Comprehensive Wildlife Conservation Plan, and the National Fish Habitat Action Plan, among others. Online information hubs like this one have been gaining in popularity in recent years for groups like these, said Buckalew. “It’s a new way that we’re accessing technology in the scientific world and also in the public arena as there’s so much information available," she said. For Kent, it’s a step in the right direction from the days of calling agency after agency asking the same questions over and over again and poring through books and papers to find information. “So, it could take weeks or months to get all that information together. But now, anybody at an agency or anywhere else can go right to our website and they can do all of that. They can look at it, they can download it. It’s a huge time saver and it also shows information that maybe people didn’t know existed," Kent said. More information can be found at portal.aoos.org.